Food is among the most basic needs for human beings. 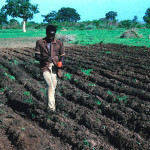 Consequently, food production, distribution, and consumption are perhaps the most important economic activities in Africa as elsewhere in the world. Food production is so important in Africa that nearly seventy percent of the population of most African countries is directly engaged in producing and distributing food. The map above gives information on the primary agricultural products for each African country. Click on each country to learn about the agricultural products it produces. 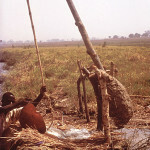 There are several modes or methods of producing food in Africa. All of these methods have been practiced for thousands of years. 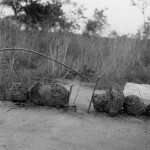 Hunting and Gathering of animals, roots, fruits. mixed farming-cultivation and animal herding. 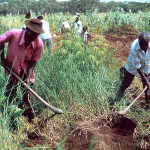 Commercial farming: producing surplus of food for trade of sale. 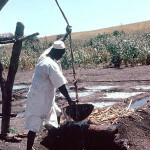 Societies throughout Africa produce food using one or more of the methods of production. 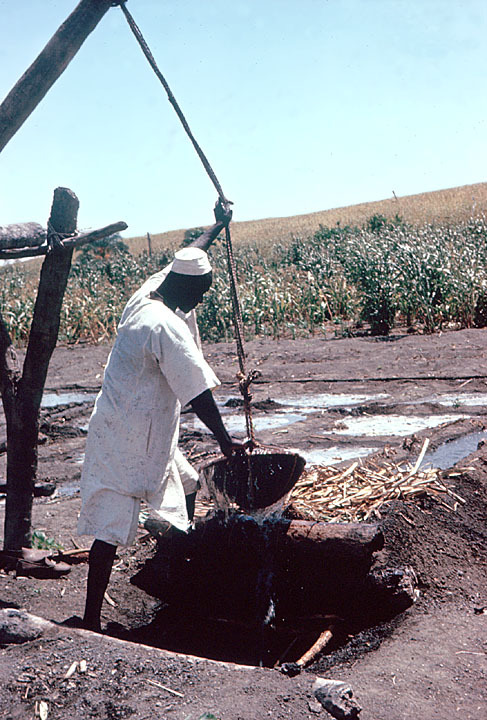 Some individuals and societies may use just one of these methods of producing food, but other individuals and societies in Africa may be engaged in several of these modes of production. 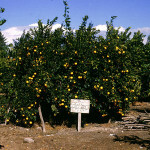 For example, subsistence farmers may hunt animals and gather wild fruits and berries to add to the food that they raise. 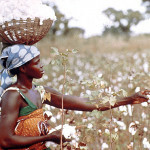 Similarly, subsistence farmers may, in addition to growing food crops, have a small field in which they produce a crop such as cotton that they will sell for additional income. Earlier this year you learned that the production and distribution of any economic good is dependent on three essential factors or inputs. 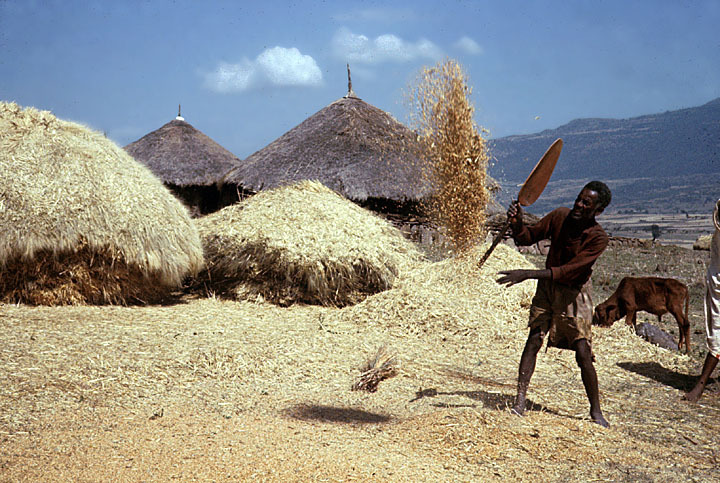 In this activity we will examine how each of the factors are part of the production of food in hunting and gathering, subsistence and commercial farming. Natural Resources. 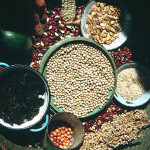 All food production systems in Africa are dependent on natural resources that include animals, seeds, water, and soil. Capital Resources. Capital resources are the tools that are used in production. 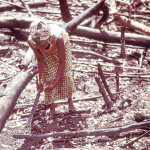 Capital resources used in food production include weapons (for hunting), hoes, plows, and tractors. Human Resources. All production is dependent on human beings. Humans provide the labor, knowledge (“how to”), and skills necessary for producing food, whether through hunting, herding, or cultivation. 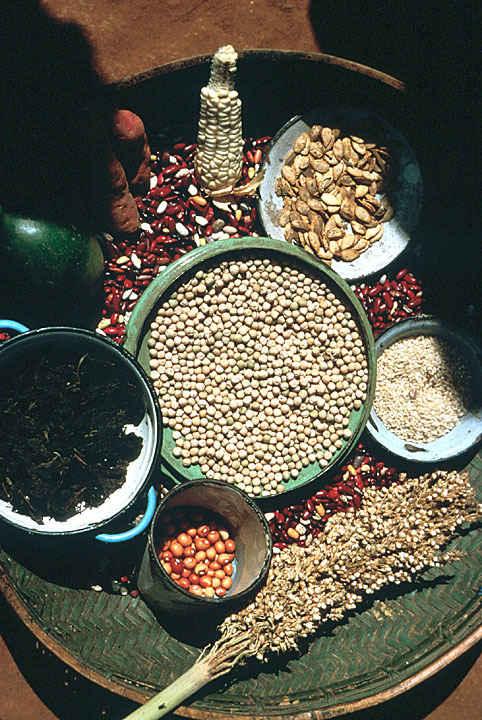 Once food is produced it can be used immediately by the producers, it can be stored safely for use in the future, or it can be distributed through exchange and trade with other individuals or groups. 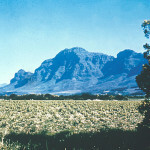 The oldest form of food production is hunting and gathering. 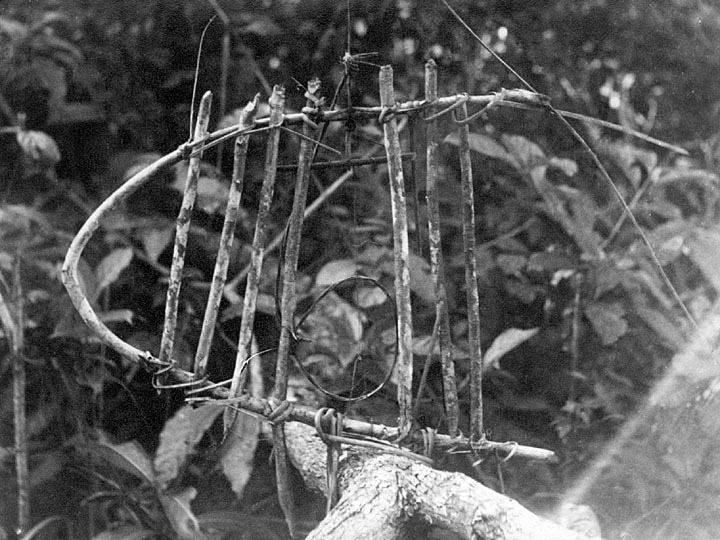 Hunting and gathering was practiced in all human societies before the development of agriculture. However, even in societies that practice agriculture, hunting of animals and gathering of roots, fruits and berries supplement food produced through agriculture. In the U.S., many people hunt and trap animals and many others spend hours of relaxation gathering wild berries. 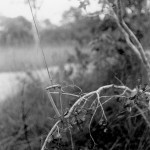 In contemporary, Africa there are only a few groups that continue to depend on hunting and gathering as their primary source of food. The Khoisan (or San) peoples live in the Namib and Kalahari deserts of contemporary Botswana, Namibia, and South Africa. They are skilled hunters and gatherers using tools, weapons, skills, and knowledge developed over thousands of years to produce adequate food and water for living. Although the nomadic San lived in small groups of extended families, they developed extensive trade networks with peoples living in the arid and semi-arid environments. Beginning in the colonial era, the Khoisan peoples have been forced by government policy to settle in permanent communities. As a consequence of this policy, many San have become dependent on alternate food sources. The Mbuti (or Bambuti) are an example of another group of people who are primarily hunters and gathers. However unlike the Khoisan, the Mbuti live in the tropical rain forests of Central Africa. Like the San, they produce an adequate supply of food using skills, knowledge, tools, and weapons that have been developed over thousands of years. 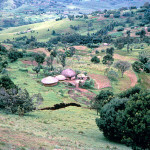 Hunting and gathering societies in either arid or forest environments live in small communities. This allows for easy mobility as groups are constantly on the move looking for fresh sources of food. 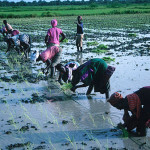 All members of society are engaged in food production. In Mbuti and San societies, men tend to be hunters and women gatherers. Your teacher will supply you with a paper copy of the graphic organizer. 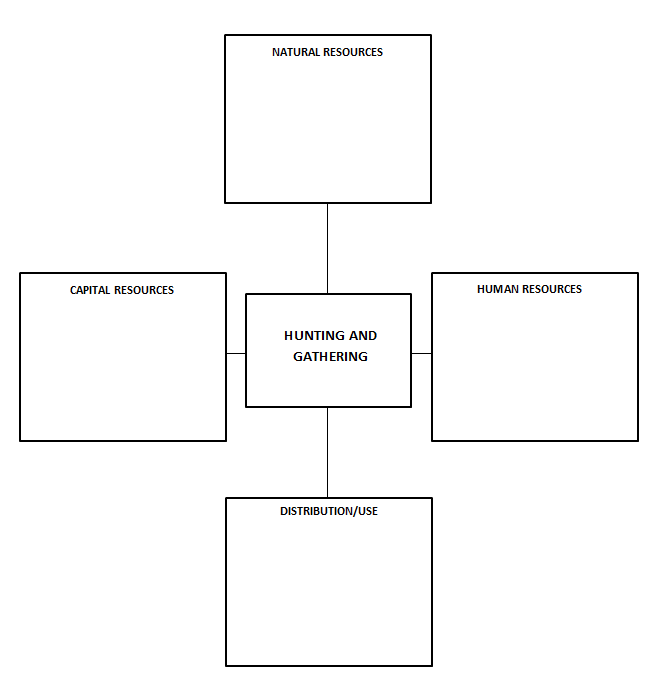 Using information provided above and in the suggested readings, fill in the four boxes with information regarding human, capital, and natural resources used by hunting and gathering societies. Around 5000 years ago, peoples in various parts of Africa began to domesticate animals to use as a source of food and for plowing and transporting goods, and textiles. 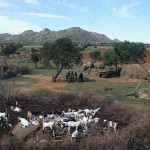 In contemporary Africa, domesticated animals–poultry, camels, sheep, goats, and cattle– are an important source of food. 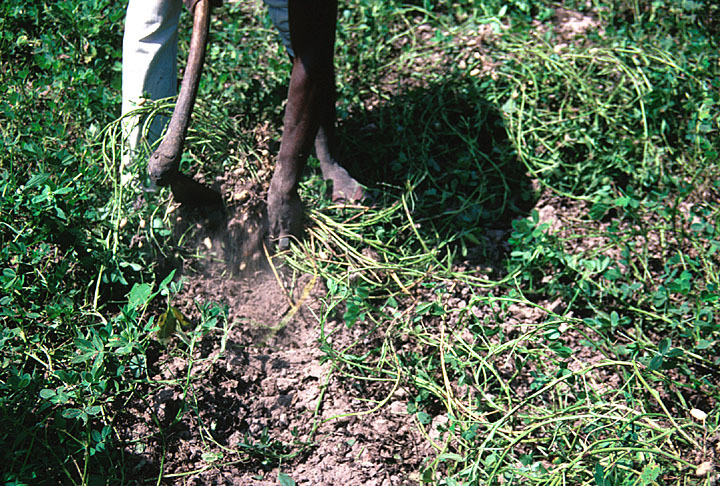 In the areas of Africa that have adequate rainfall and soils, people practice some form of mixed agriculture. That means that they grow crops and keep domestic animals. 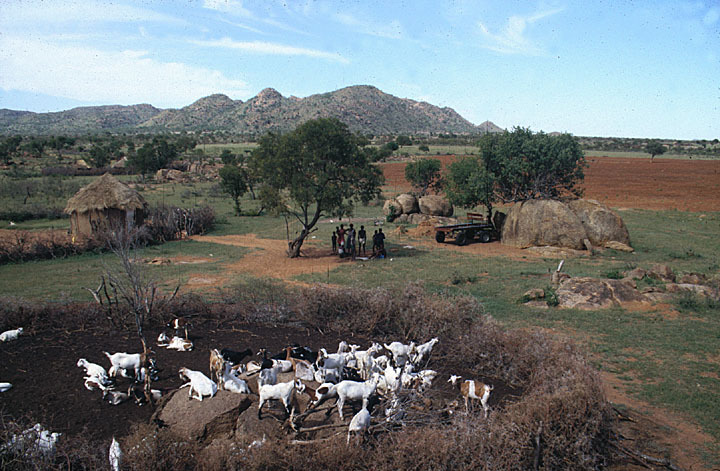 In large areas of Africa that have low rain-fall or are semi-arid, herding of livestock is the primary economic activity and method of food production. 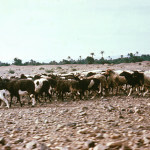 Livestock– sheep, goats, camels, or cattle-need water and fresh vegetation. 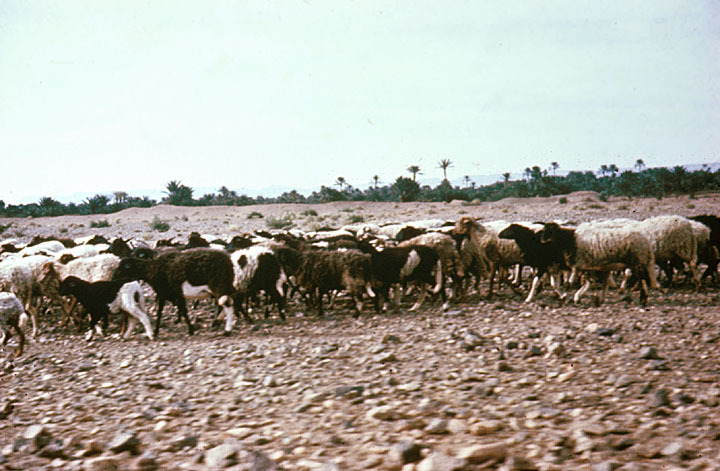 The need for water and grass necessitates a semi-nomadic existence for herders. 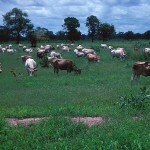 Societies whose primary economic activity is herding depend on their animals for milk and meat. In addition, most herding economies trade animals with farming groups and supplement their food supply with grains and vegetables. 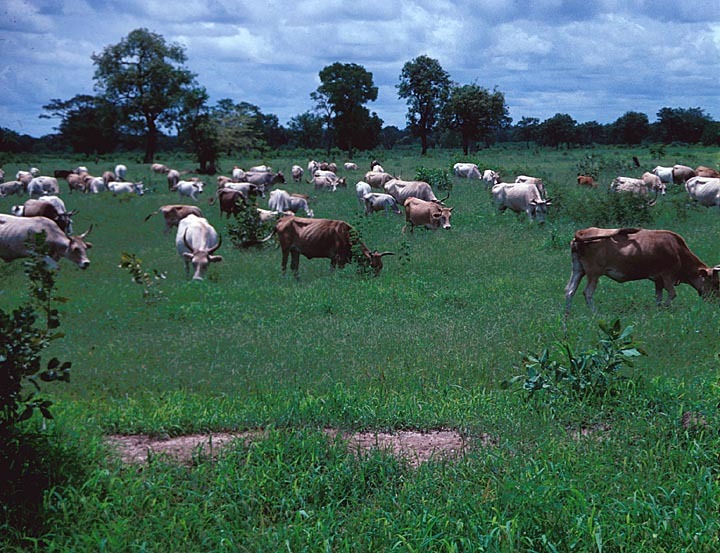 Semi-nomadic herding production is dependent on the availability of large areas of land in which to herd livestock. Consequently, societies whose economies are based on herding tend to cover a large geographic area. In addition, as will be noted in Lesson Ten: African Political Systems, the economic necessity of movement causes herders to move in small groups, making it more difficult for herders to organize themselves into strong political systems. 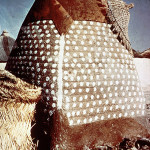 African herders bring to their craft knowledge and skills that have been developed over thousands of years. However, the knowledge base of herders is not static. For example, contemporary veterinary knowledge and medicines have been adopted and used to increase the productivity of herds. 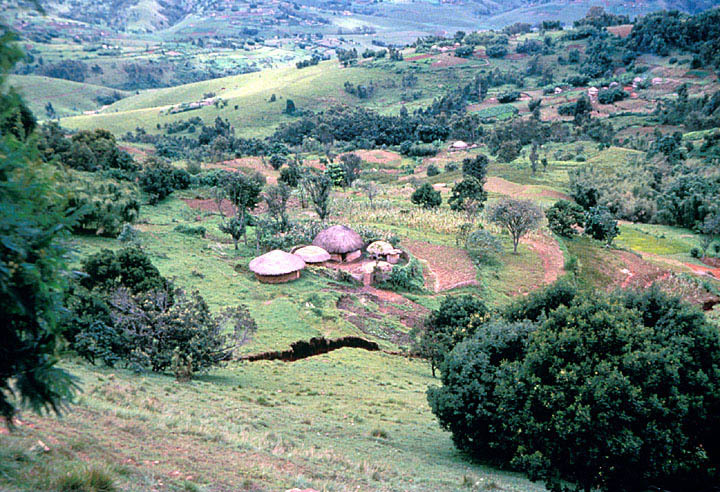 You will remember from Module Six: The Geography of Africa that Savannah vegetation and climate dominates more than a third of Africa. Savannahs are found in Central, East, Southern, and West Africa. Consequently, herding societies are found in all of these regions of Africa. To learn more about herder economies you may want to read more about specific herding societies. Your teacher will supply you with a paper copy of the graphic organizer. 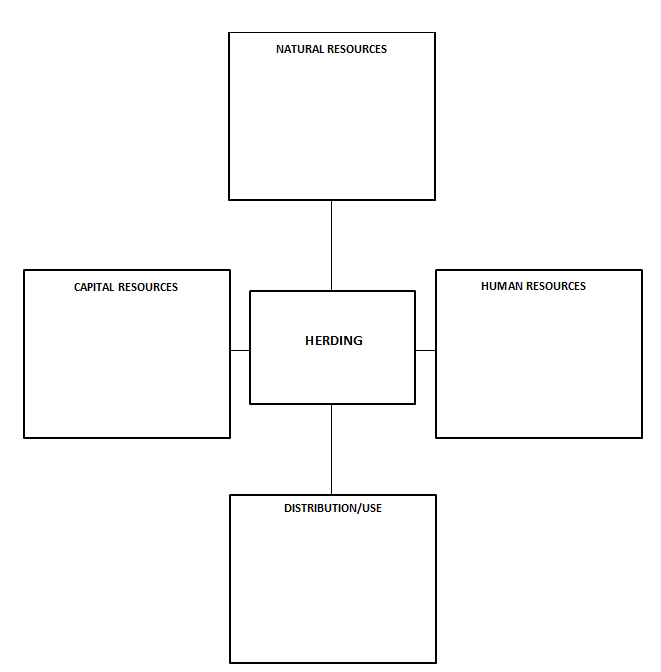 Using information provided above, fill in the four boxes with information regarding human, capital, and natural resources used by herding societies. 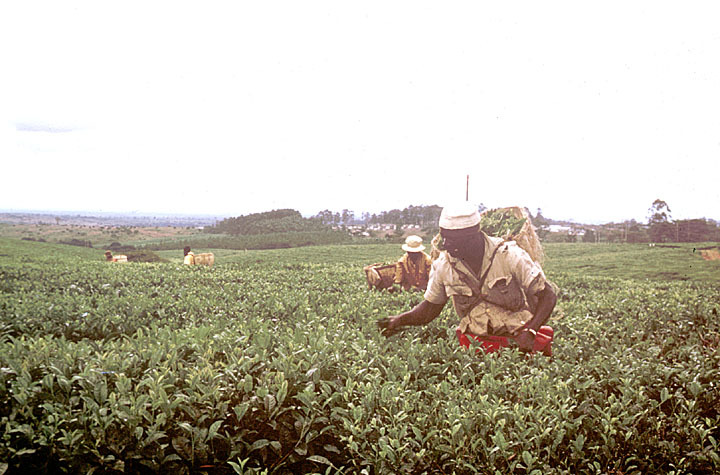 Until quite recently, the majority of people in many African countries were economically engaged in subsistence agriculture. 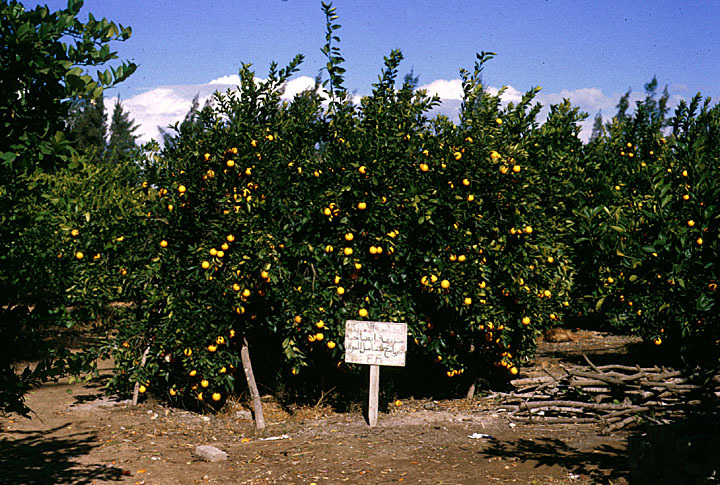 Subsistence means to produce enough to meet consumption needs with little or no surplus. In Lesson Six: Africa and Its Geography, you were introduced to a selection of the primary food corps in Africa. 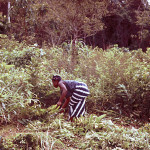 Depending on region, climate, and natural vegetation, a variety of different food crops are produced by subsistence farmers. 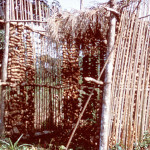 In the forest and wet savannah regions of West Africa, yams, rice, cassava, and maize (corn) are the primary food crops. 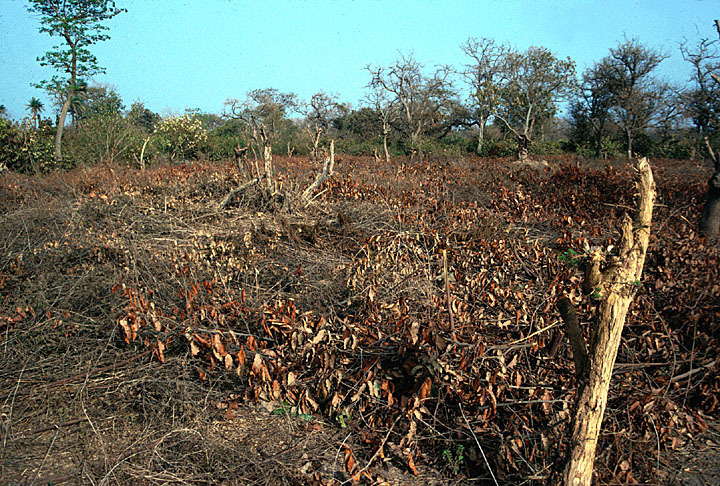 In somewhat dryer areas of West and Central Africa, cassava, millet and sorghum are the primary food crops. 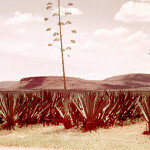 In the savannah regions of East and Southern Africa, maize, sorghum, and millet are the main food crops. 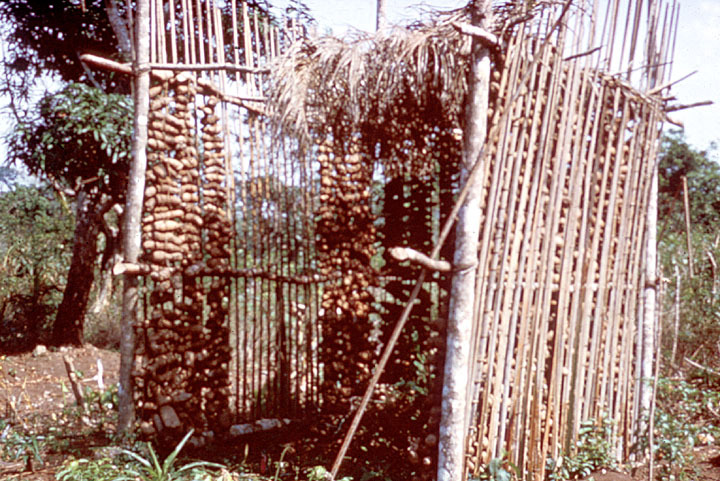 In addition to these root and grain groups, subsistence farmers grow a variety of vegetables which are eaten with the primary food. Moreover, most subsistence cultivators in Africa keep some domestic animals such as poultry, goats, and at times, cattle. 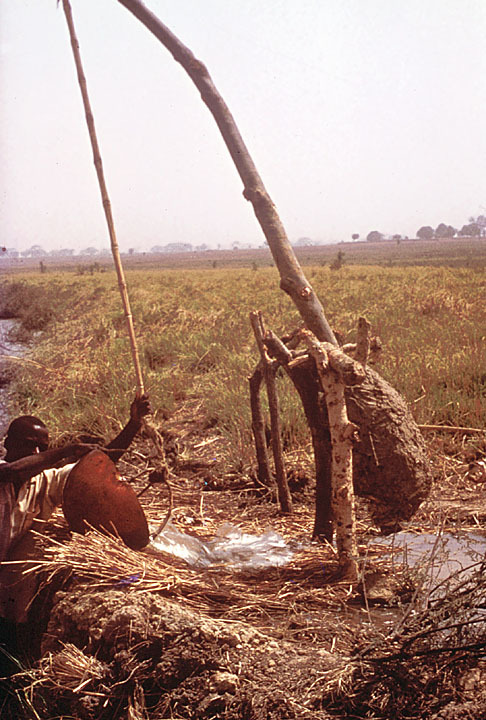 In small scale subsistence farming, cattle serve multiple purposes. They provide milk and meat, but they are also used to pull plows. Moreover, in many farming societies cattle are a symbol of wealth and can be use as gifts of exchange at very important ceremonies such as marriages. 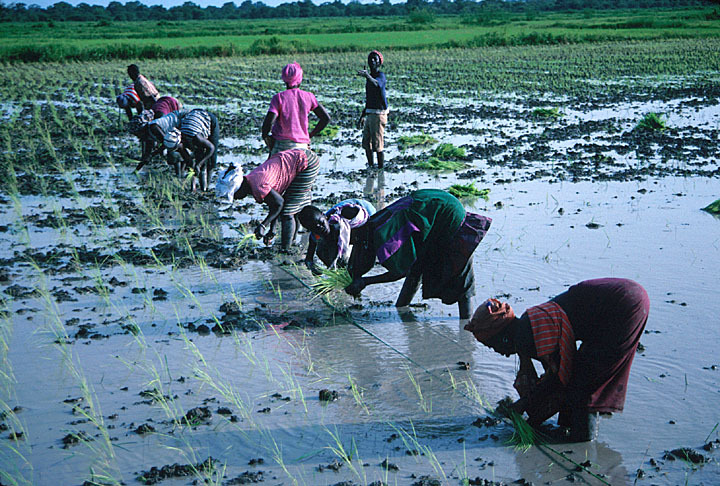 Farmers in Africa draw upon deep reservoirs of knowledge and skill in the practice of farming. 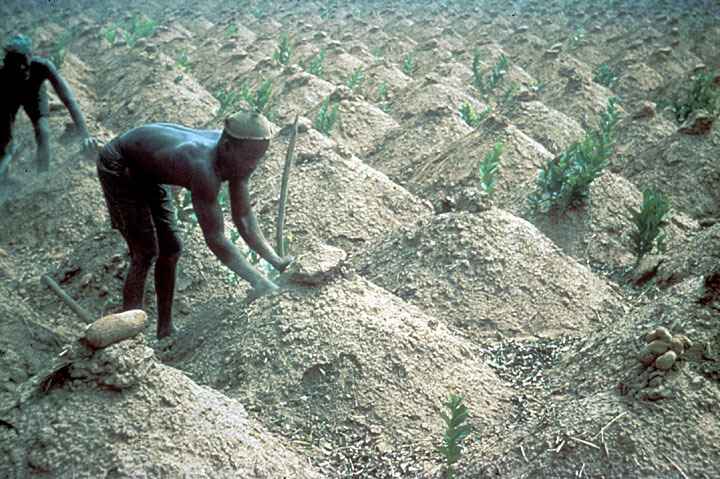 Hoes, of various shapes and sizes, plows and other digging implements manufactured from iron and other metals are the primary tools of subsistence farming in Africa. 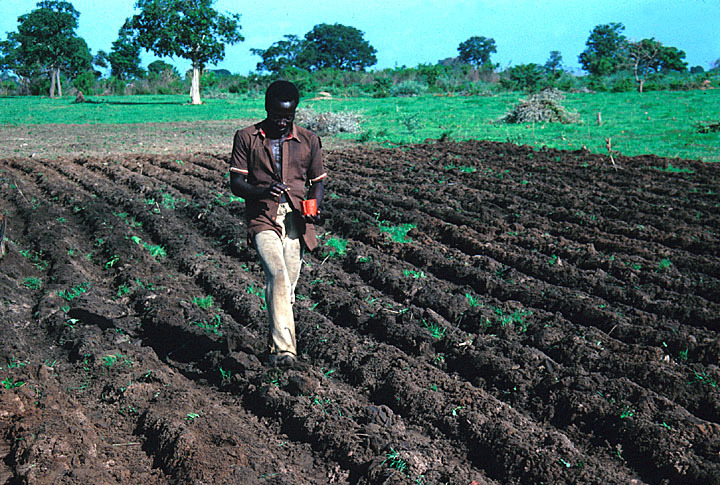 In areas where soils are marginally fertile, farmers practice shifting agriculture. 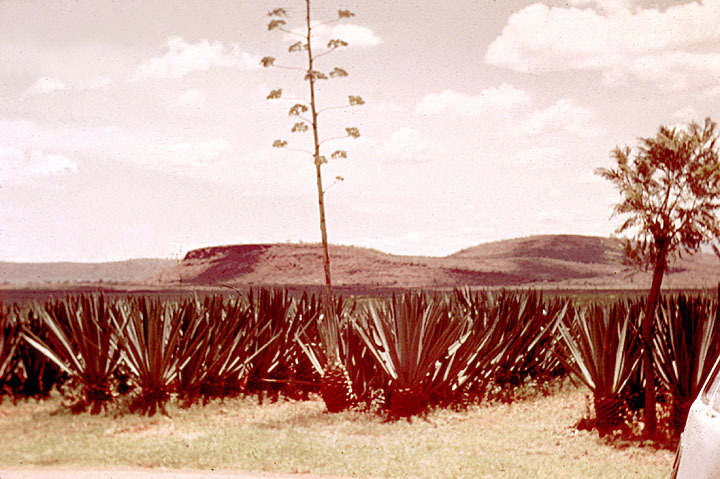 In this system, a given area of land is cultivated for two to three years after which it is left fallow (land not used for cultivation, allowed to return to its natural vegetation) for five to eight years during which time the soil is rejuvenated. 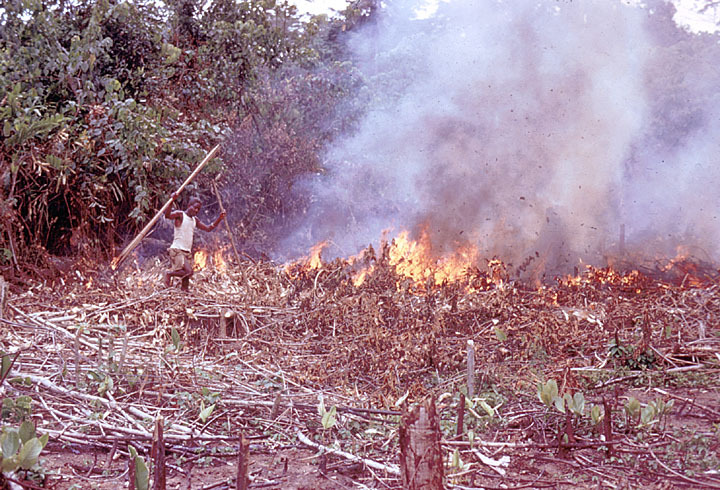 After farming a given area of land for two to three years, farmers will clear another piece of land for planting. Like herders, African cultivators are open to new ideas and practices. They draw on new knowledge and techniques when available to enhance their productivity. 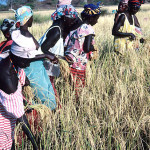 In most African farming systems, all members of the household or extended family are engaged in farming. Women, men, the elderly, and children all have important roles to fulfill, even though the specific roles will vary among households and societies. In many farming societies, children, when not in school, are given the tasks of herding animals, fetching water, scaring away birds, and watching after younger siblings while their parents are busy with more physical labor. You will note that in the accompanying photos, much of the work on subsistence farms is done communally, as farmers share the major tasks of cultivation on each other’s plots of land. 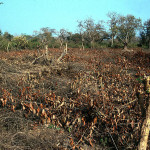 Clearing land: Before the rainy season begins. 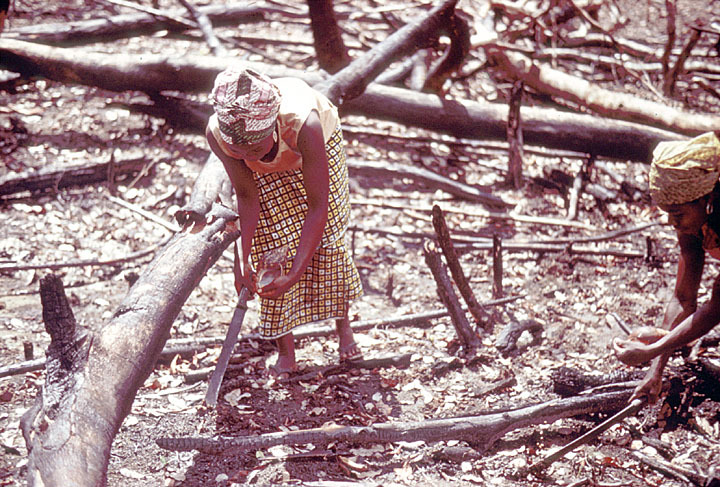 In clearing the land, farmers use axes and machete-like knives to clear vegetation. 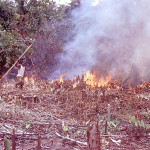 After the vegetation is cleared, the brush is set on fire. After the brush, is burned the land is ready for plowing. 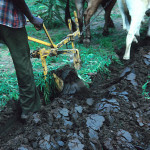 Plowing: After the land is cleared, the farmers prepare the land for planting by plowing with either a animal drawn plow or with large hoes. 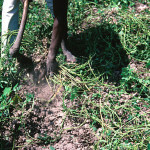 Planting: After the land is prepared, the farmer plants the seeds or root-sections. 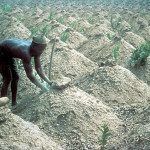 Weeding/fertilizing/transplanting: The farmer’s work is never complete. As soon as the plants germinate, the farmer is busy with weeding, applying fertilizers, and, in the case of rice, transplanting seedlings. 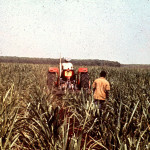 Tending of crops continue until harvest. 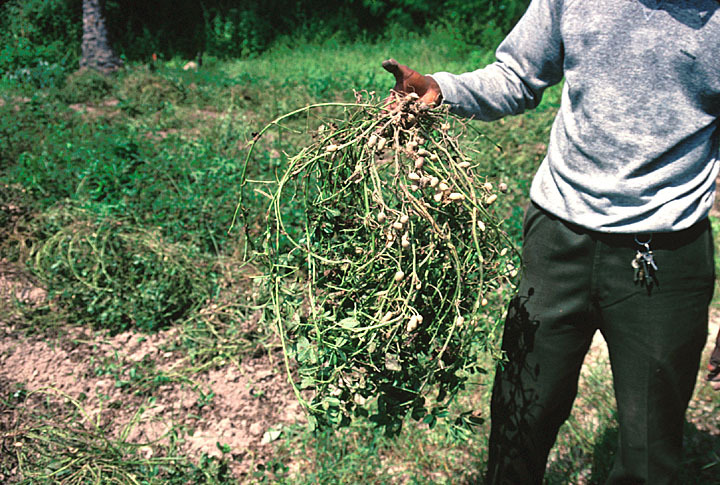 Harvesting: When the plants are mature, the farmer harvests the crops. 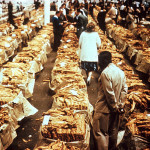 Preparation for storage or sale: After harvesting, the farmer tackles the task of preparing the food crop for storage or sale. 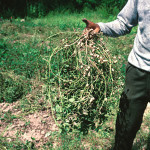 Preparation can include winnowing, shelling, and bagging produce. 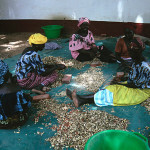 While subsistence farmers do not produce large surpluses, they often barter or sell crops in order to meet basic needs. 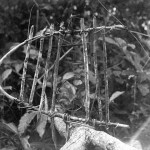 For example, they may barter crops with an iron-smith to obtain tools they need for farming. Or they may sell some of their produce in order to raise the money they need to send their children to school. Your teacher will supply you with a paper copy of the graphic organizer. 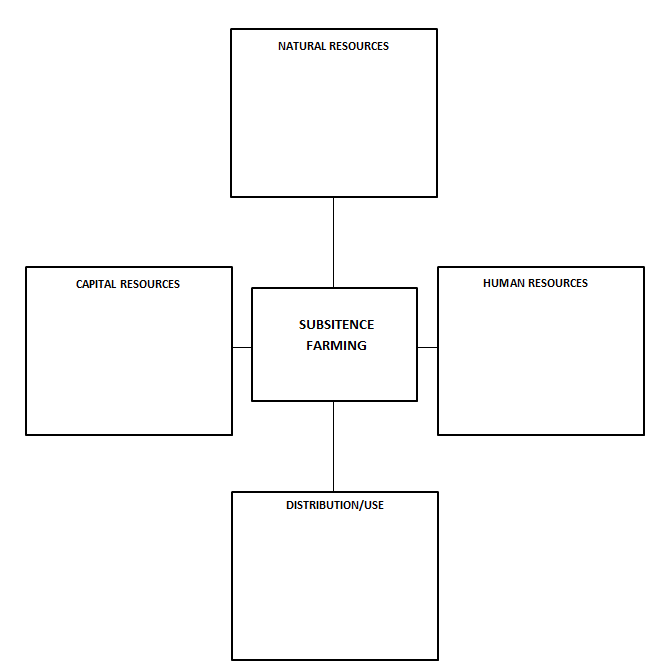 Using information provided above and in the suggested readings, fill in the four boxes with information regarding human, capital, and natural resources used by subsistence farmers. 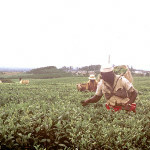 Commercial agriculture is the production of agricultural products used primarily for sale or trade. 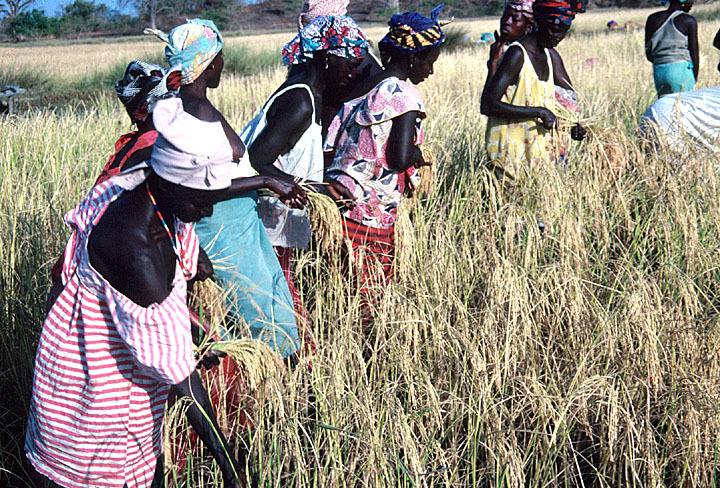 Unlike subsistence agriculture that is oriented towards maintaining family subsistence, the goal of commercial agriculture is to generate income and profit through the sale of agriculture products produced on the farm. 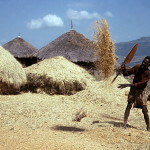 Three factors led to the development and expansion of commercial agriculture in Africa, Asia, the Americas, and Europe. First, innovations in food production continually took place through history as farmers become more skilled in crop and animal production. Increased productivity in food can often result in a surplus. In societies where there is a continual surplus of food production, some people will be freed from agricultural labor and will pursue other occupations. 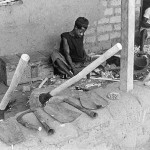 The surplus production of food facilitated the development of specialized occupations such as metal smiths and weavers. Such persons, freed from having to produce their own food, had the time to develop skills and knowledge related to their selected occupation. 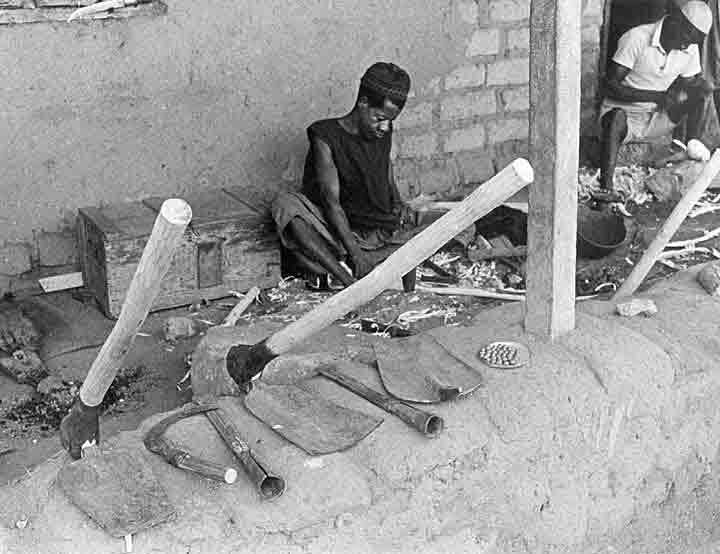 Diversification and specialization of occupations could not take place if there was not a surplus of food, which could be obtained by skilled artisans. 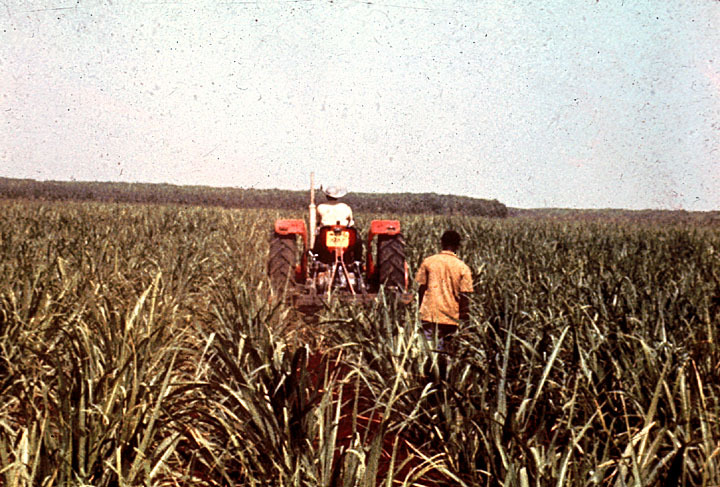 Second, commercial agriculture developed in Africa as in Asia, Europe, and the Americas in response to industrialization and urbanization. With the development of industrialization and cities, came a demand for food to feed urban workers. Farms primarily producing food for sale developed to meet these needs. 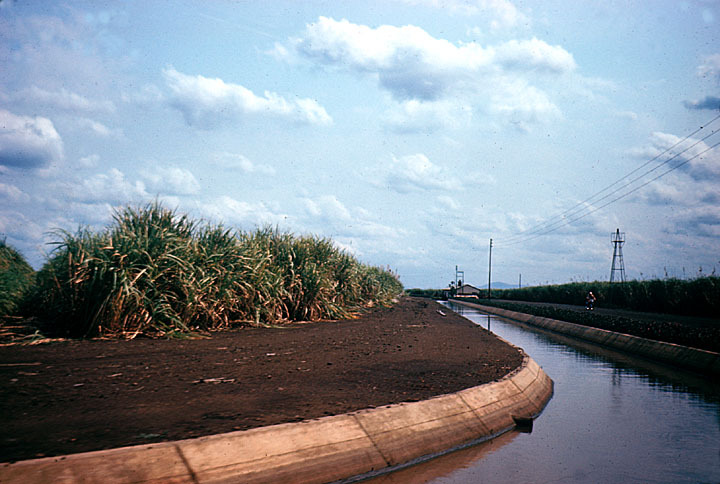 Third, early industrialization was directly related to agricultural production. 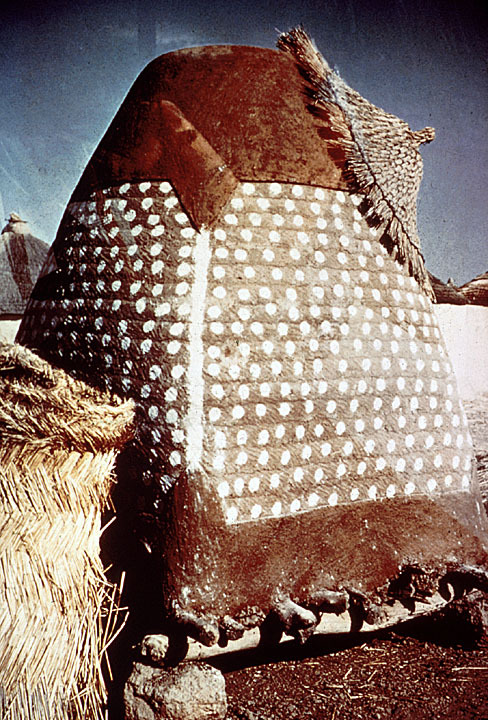 For example, some of the earliest industries in Europe and in Africa were textile manufacturing. 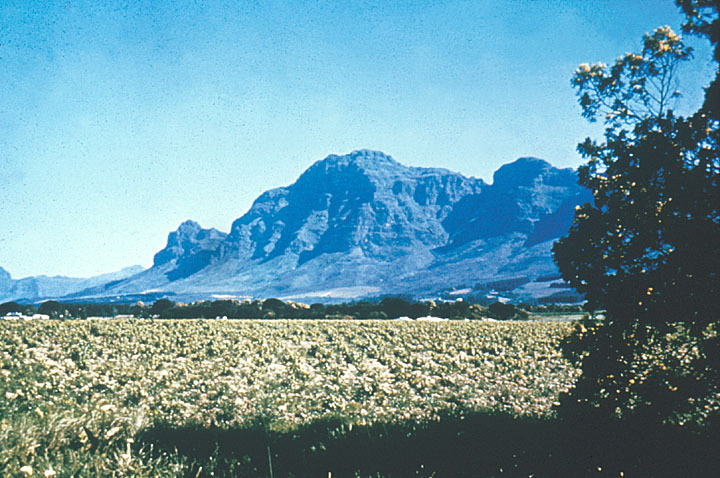 The raw materials necessary to this industry were agricultural, primarily cotton and wool. 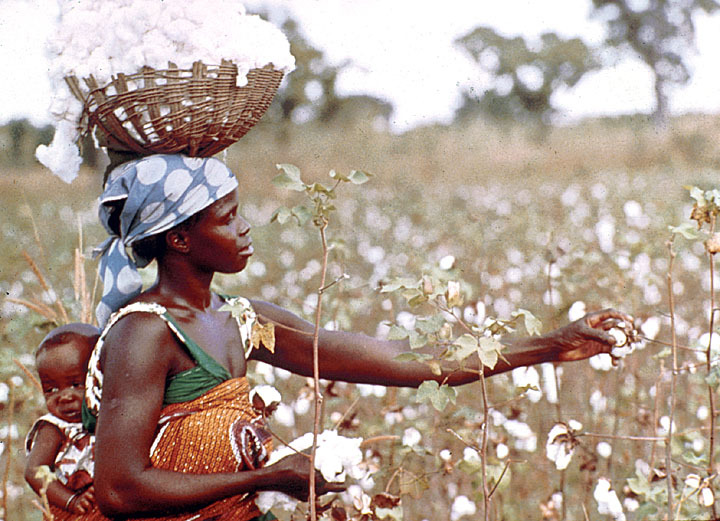 As will be highlighted in the next section, the commercial production of cotton became a central economic activity in the Twentieth century in a number of Africa countries such as Mali, Niger, and Sudan. 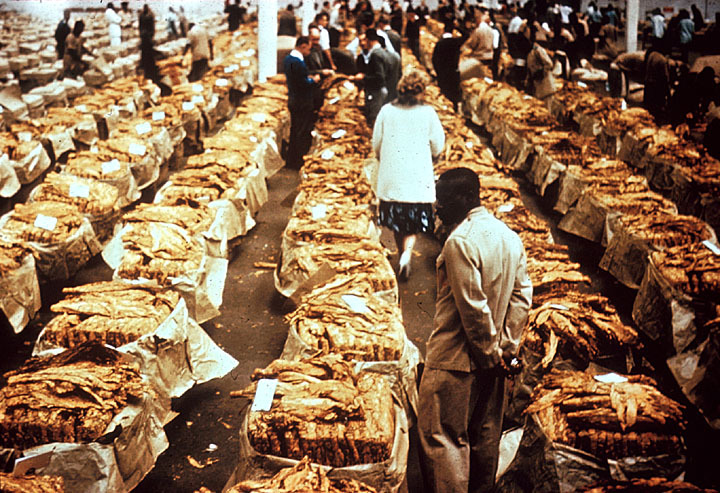 In recent history, there are two types of commercial foods have been produced commercially in Africa. 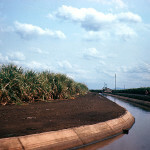 First, there are the basic or necessity foods used in urban consumption. These foods would include commercially raised rice, maize, wheat, meat, eggs, and dairy products. Second, there are the less basic luxury foods such as sugar, coffee, cocoa (chocolate), and tea. 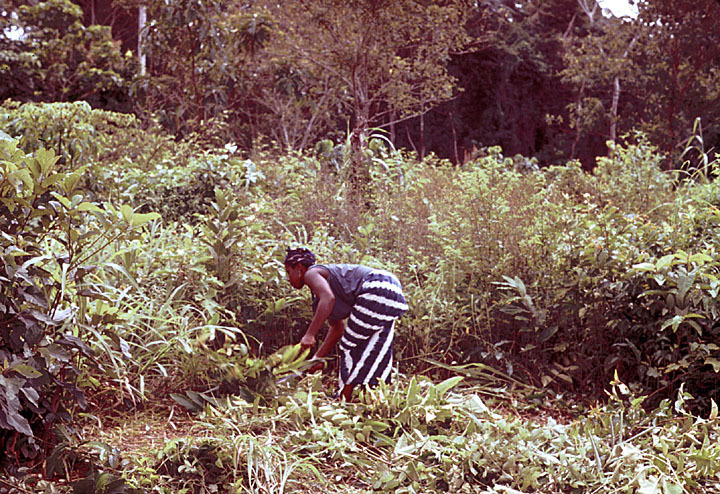 Colonial agricultural policies help explain the way commercial food production is practiced in African countries. 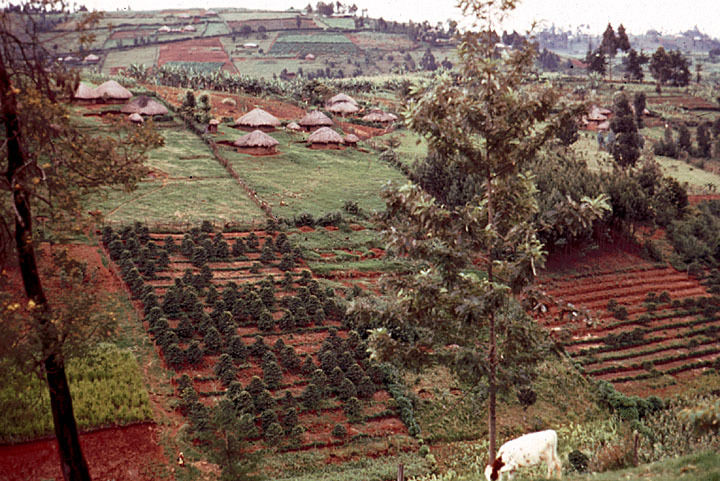 One example of how colonial policy impacted agricultural production is the case of coffee, a commercial crop grown in a number of different African countries. Small scale production of coffee. 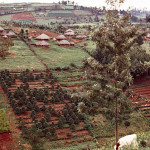 In countries such as Ethiopia (where coffee was first grown), Rwanda, Cote D’Ivoire, and Uganda, coffee is produced commercially on small to medium size family farms. 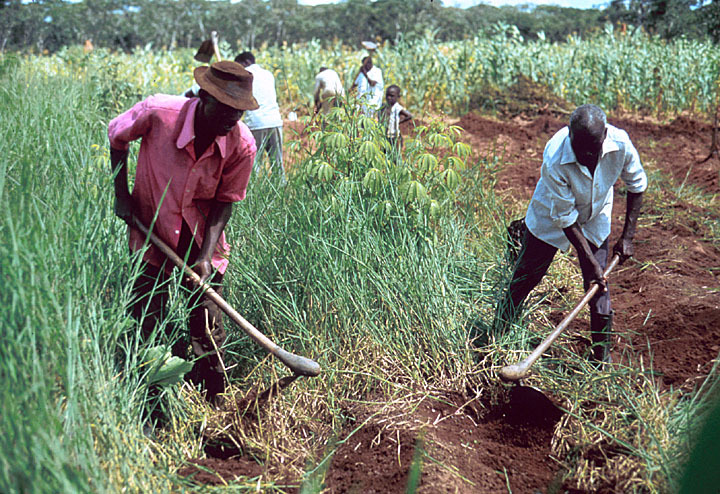 In such cases, the land is owned by the farmer, and the farmer is dependent primarily on the labor of family members, although at times the farmer may have to hire temporary workers. Money earned from the sale of the coffee goes to upgrade equipment, buy fertilizer and chemicals, and to support the farming family. Large scale production of coffee. 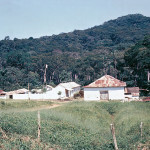 In other countries such as Angola and Zimbabwe, where coffee is also an important cash crop, production is quite different. During colonialism, these countries were settled by large numbers of European immigrants. 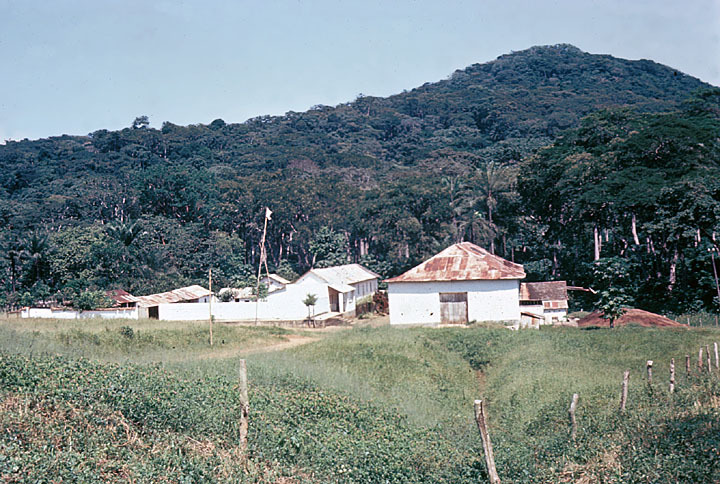 A number of these settlers became actively engaged in commercial agriculture, including the production of coffee. 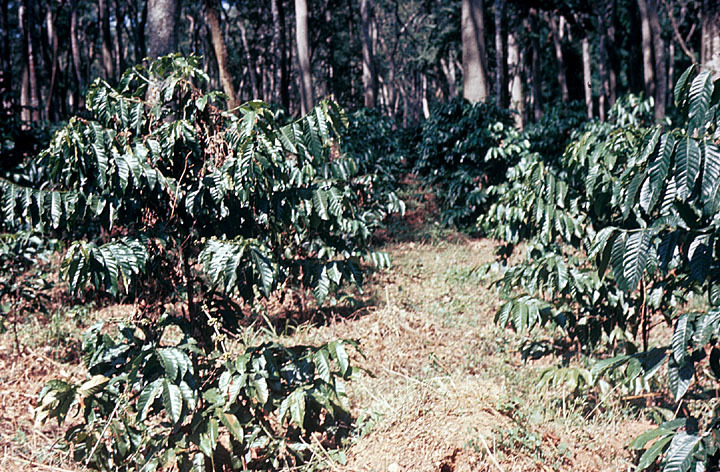 In these cases, coffee is grown on large farms or plantations. The land is owned either by the settlers or by an international company. The labor needs of these large farms are met by workers recruited from rural areas who are often landless, and unable to be even subsistence farmers. 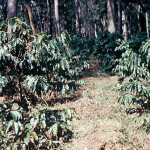 Money earned from the sale of the coffee goes to improve the farm and into the accounts of the owners. This system has been criticized because workers are paid low salaries and because most of the profits earned are not re-invested in the local communities and economies. Your teacher will supply you with a paper copy of the graphic organizer. 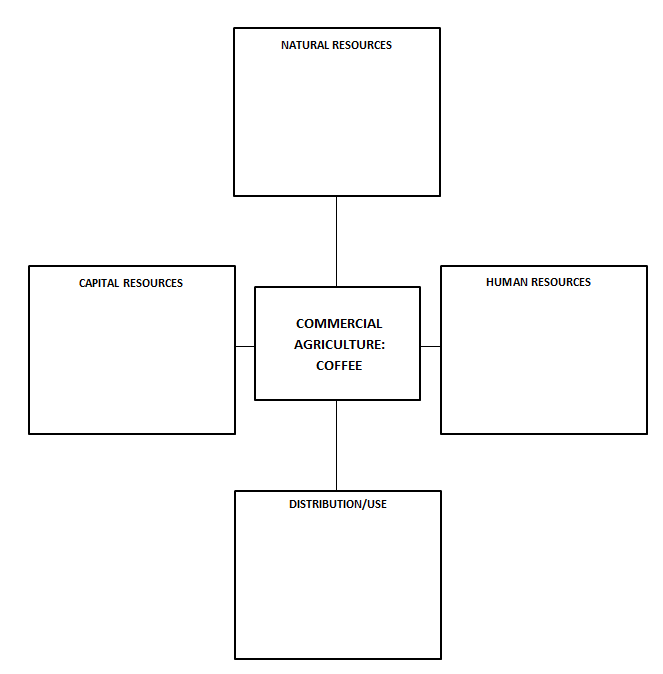 Using information provided above and in the suggested readings, fill in the four boxes with information regarding human, capital, and natural resources used by coffee farmers.